Sat., Apr. 13, 11am Vintage Acessory Sale at the Catlin House; Looking to update your wardrobe with vintage pieces? The Society will hold a vintage clothing and accessory sale on Saturday, April 13 at the Catlin House. The sale will feature deaccessioned items from the LHS collection, including women’s shirtwaists and assorted clothing, bed and table covers, and accessories including gloves, stockings, and shawls. Doors will open promptly at 11 a.m. Proceeds will be used to continue the preservation of the objects in the LHS collection. Sat., Apr. 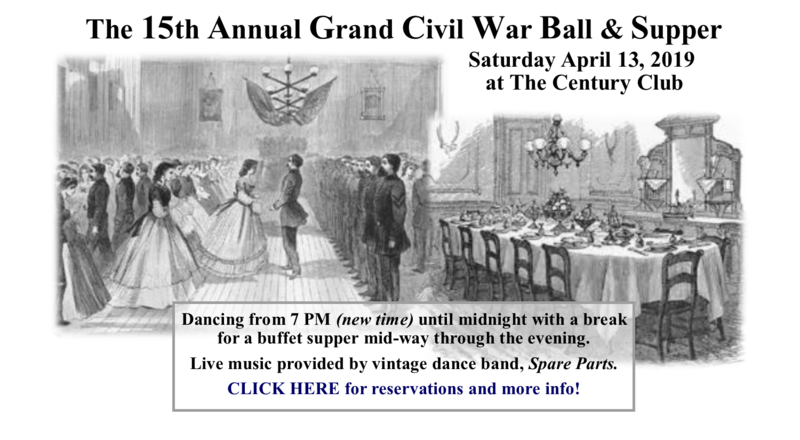 13, 7pm 15th Annual Crand Civil War Ball at the Century Club Click Here for more info and to Purchase tickets. 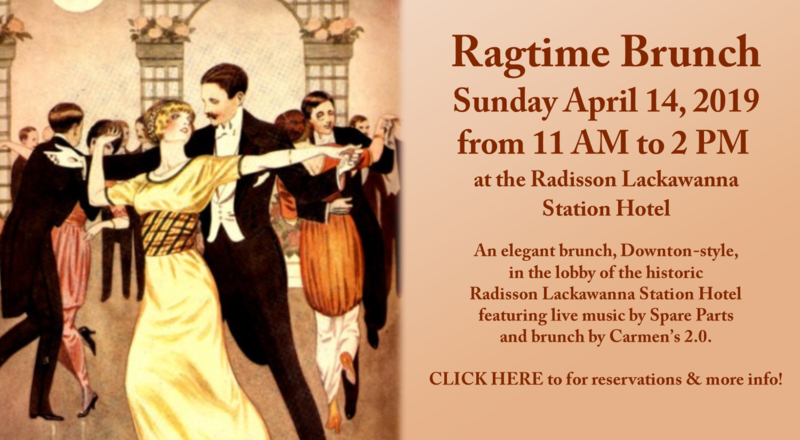 Sun., Apr 14 Ragtime Brunch at Carmen's 2.0 At the Radisson Lackawanna Station Click Here to purchase tickets. The program, is the open to the public and will focus on the various military campaigns on the Mississippi River, which was a vital highway for troops and supplies, and both the Union and Confederate navies fought for control of the waterway and its access points. Wed., Apr. 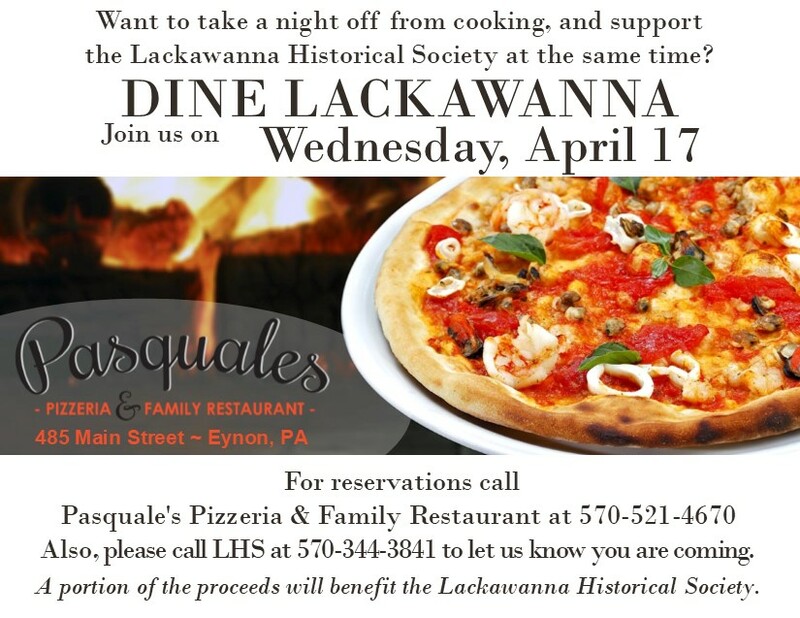 17th Dine Lackawanna: Pasquales Pizzeria and Family Restaurant, 485 Main Street, Eynon; Call 570-521-4670 for reservations to Enjoy a night out and help support the Society by dining out at these locations! Sat., May 4, 6 pm You Live Here; You Should Know This! Local History Game Show at the Slocum Hollow Bar at the Lodge at Montage Mountain; Join us for the return of the LHS local history game show! Can last year’s winners, the Lackawanna Historical Society, defend their title? Challengers are still coming to the table, but returning favorites include Sen. John Blake, Albright Library staff and the Riverside School District administration. The games will continue in a fast-and-furious Jeopardy! style, testing contestants’ knowledge of local people, places, and events. Winners will have exclusive bragging rights for one whole year of holding the status of Local Lackawanna History Legends of Lore! Wed., May 15 Dine Lackawanna at Backyard Ale House; 523 Linden St, Scranton, PA 18503 Call (570) 955-0192 for reservations to Enjoy a night out and help support the Society by dining out at these locations! Wed., May 22, 7 pm Monster Sized History: Reviving a Giant Stationary Steam at the Catlin House; Interested in heavy-duty industrial history? Join us on Wednesday evening, May 22 at 7 p.m. for a program by Mike Piersa of the National Museum of Industrial History in Bethlehem. Mr. Piersa, who recently worked on the restoration of the most powerful operating waterworks steam engine in the United States, will illustrate how this 35-foot long, 115-ton steam powered water pumping engine was transformed from a rusting hulk to a museum centerpiece. The nine-year project of relocating and restoring the engine will be detailed, showing how traditional skills and modern technology are coming together to bring the engine back to life for a public debut in June 2019. The program will also include a live-action demonstration of a model steam engine from the Lackawanna Iron & Coal Company in the Society’s collection! Sat., June 8, noon - 3 pm Public Scanning Day; Do you want to share your family history? On Saturday, June 8, from noon - 3 p.m. the Society will be hosting a public scanning day for “Lackawanna Memories: The Early Years,” a photo book to be published by the Scranton Times. The publisher is looking for photos showing Lackawanna County’s history - local businesses, street scenes, community celebrations, local sports teams, school events, military service members, farming, hunting, fishing, and more. Wed., June 19 Dine Lackawanna at State Street Grill 114 South State St., Clarks Summit (570) 585-5590 for reservations to Enjoy a night out and help support the Society by dining out at these locations! will be announced in May! The cost is $45* and reservations are required. Sun., June 23, 11am - 4 pm Rooted in the Hill House and Garden Tour; The Society’s popular biannual tour of homes will return on Sunday, June 23 from 11 a.m. to 4 p.m.! This year, we are partnering with the Greenhouse Project to host “Rooted in the Hill,” a tour of historic homes and “secret” gardens in Scranton’s Hill Section. Tour participants will have a chance to learn more about the city’s architecture as well as expand their green-thumb skills with new ideas from home gardeners and the Penn State Master Gardeners. Tour tickets can be purchased in advance for $25 or on the day of the tour for $30. *Combo tickets for the cocktail party and the tour can be purchased for $60. (Party only is $45) As always, free shuttle rides will be provided to all sites on the tour throughout the day. Thanks to Cruz Control Transportation for donating this service. Call us at (570) 344-3841 or stop by the Catlin House for tickets today!